ARMONK, NY	- 15 Dec 2006: SECOND LIFE -- IBM (NYSE: IBM) today announced it is working with Circuit City Stores, Inc., a leading specialty retailer of consumer electronics, to explore how to apply virtual worlds and 3-D environments to retail business models. The relationship aims to experiment with the introduction of virtual worlds and 3-D environments into the multi-channel retailing environment. As retailers focus on improving the customers' experience, connecting the virtual world with the real world to solve business problems can create a richer, more immersive experience for Circuit City's customers. This work is an extension of IBM and Circuit City's existing systems collaboration. To kick off this experimental work, the companies have opened a prototype virtual Circuit City store, which replicates in 3-D products available in real Circuit City stores and on circuitcity.com. The Circuit City prototype store is part of an IBM complex opening to the public next week in the virtual world of Second Life. with using virtual worlds for commerce, customer service and collaboration. "Teaming with IBM in the virtual world is as much about sensing and learning from the community as it is about commerce. These immersive environments provide an interactive forum for testing and feedback as we focus on the next generation of customer service," said Bill McCorey, senior vice president and chief information officer of Circuit City. "Our ultimate goal is to understand the implications of virtual 3-D worlds on multi-channel retailing and to extend the connection we have with our customers to new spaces." A number of experiments are already underway with the virtual store. For example, instead of browsing through a catalog on a Web site, consumers can use their "avatars" -- a 3-D virtual representation of themselves -- to walk the aisles of the virtual Circuit City store and pick up and examine products in a way that is closer to real life. Customers can then order those items to be delivered to their homes, much like the way they would order on the Internet. Some of the richer features under development will showcase Circuit City's strategy of providing multi-channel touch points to the consumer, driving customer service and extending its community of customers and experts from its stores and forums online to the virtual world. An immersive feature that IBM and Circuit City are experimenting with includes an interactive home theater setup, where customers can easily recreate their own home environment, and figure out the optimal size television to purchase based on room dimensions. These features allow a user to have their avatar move a couch back and forth to set it at the proper distance from where they would like to position a new TV, and it automatically tells them the optimal size TV to purchase for their room dimensions. The companies will explore additional features, such as where to set up speakers and other audio and visual components. The companies are also researching the potential to add other features in customer service. For example, instead of a customer calling in with a technical issue, they can actually go to the 3-D virtual environment and figure out exactly how and where to fix or examine the product to find the problem and get it resolved. If someone purchases a new digital camera on circuitcity.com and wants to learn how to use all of the features, instead of reading a product manual they can immerse themselves in the 3-D environment and actually "see" how to use the camera and all of its features. Circuit City is also exploring how to extend its online forums -- where its customers help each other by rating and reviewing products they have purchased -- into the virtual worlds. The virtual worlds are built around communities and provide a natural forum for people to connect and collaborate. These experimentations -- with innovative companies like Circuit City -- are part of an IBM-led initiative to collaborate with clients and partners in three ways -- conducting business inside virtual worlds; connecting the virtual world with the real world to create a richer, more immersive Web environment; and to solve business problems in a new way. IBM is opening up areas in Second Life previously inaccessible to the general public. On these "islands" -- which are spaces where people can build three-dimensional objects and interact with other people in a way that is more visual and real -- IBM has been experimenting on extending virtual worlds for business. Three key areas in business include: virtual commerce and work with clients to apply virtual worlds to business problems; driving new kinds of collaboration and education; and experimentations on pushing the limits with a broad community on what might be possible in virtual worlds. IBM is working with dozens of clients to experiment and help them understand and apply virtual worlds to their business. While IBM is prototyping and developing in Second Life, it has a bigger strategy to collaborate with a community in an open source fashion to build out the next generation Web, which IBM and others call the 3-D Internet. IBM also aims to build a platform for "serious" business, including 3-D Intranets inside of a company firewall where private and confidential business can be conducted. In addition to virtual commerce, IBM works with clients, employees and alumni to use virtual worlds to drive collaboration and provide a more immersive online educational experience. For example, IBM uses virtual worlds to connect with its alumni population and for on-boarding and educating new and current employees. Virtual worlds have proven an effective tool to help simplify the complex, with 3-D models and interactions that cannot be recreated in a Web conference or phone conversation, and have been useful in connecting people around the globe to drive collaboration. IBM and Circuit City are teaming to explore and experiment with the applications of virtual worlds and 3-D environments on retail business models. 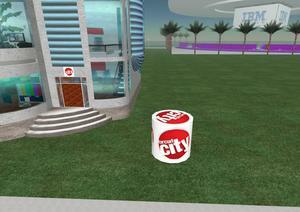 The prototype virtual Circuit City store replicates in 3-D, products available in real Circuit City stores and on circuitcity.com. The companies are experimenting with using virtual worlds for commerce, customer service and collaboration.